Continuing its operations against arrested businessman Paras Mal Lodha, the Enforcement Directorate has recovered a stash of diamonds, rubies and jewellery from a bank locker allegedly belonging to him in Kolkata. The locker, located in a public bank branch in Alipore road in Kolkata, was opened on Wednesday by a team of ED sleuths and the agency is now trying to evaluate the exact price of the recoveries, even as two more bank lockers belonging to Lodha are to be opened in as many other banks based in the city. The agency had launched searches on two premises of Lodha in the West Bengal's capital on December 27 following which it proceeded to search the bank lockers. The locker contained some diamonds, rubies and a lot of other jewellery which are being evaluated now, they said. During the searches on Tuesday, the agency had also seized some documents related to a purported Swiss bank account. The ED is investigating Lodha after it booked him on criminal charges for his alleged involvement in two high-profile black money cases of illegal conversion of old notes post demonetisation. Lodha, 62, is also expected to be produced in a court in Delhi as his ED custody ends Thursday. The agency, as part of the searches in Kolkata, covered two of his premises at S N Roy road and Queens Park even as one of his locations in Delhi's elite Lutyens zone area was brought under the operation a few days back. 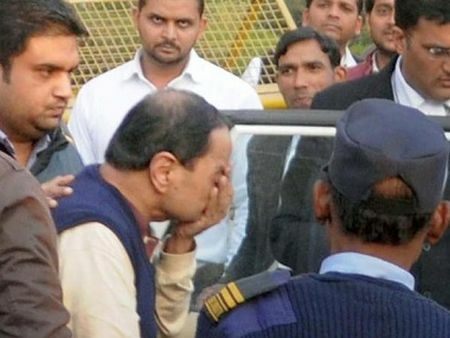 Lodha was arrested by the agency in "connection with the recovery of large amount in new currency notes from a company belonging to Rohit Tandon and J Sekhar Reddy of Chennai". The agency had earlier claimed that he was involved in a "deep-rooted conspiracy" in this case and that he was charging a commission "at the rate of 15-20 per cent" to convert old notes into new ones of several people. It had said Lodha admitted that "post demonetisation he and his associates had converted old currency of at least Rs 25 crore into new currency notes." While Tandon's case pertains to an operation of Delhi Police and the Income Tax department earlier this month when the agencies had allegedly seized Rs 13.6 crore from a law firm he is associated with, that of mining baron Reddy relates to Chennai where the I-T department has made the biggest detection of alleged unaccounted income of over Rs 142 crore including Rs 34 crore cash seizure in new notes of Rs 2,000. Tandon has also been arrested by the ED in Delhi on Wednesday. Both the cases pertain to the ED's anti-black money operations post the currency ban. These two cases, involving Tandon and Reddy, are being probed by at least four agencies -- the ED, the Income Tax department, the CBI and Delhi Police. Demonetisation: It's a monumental disaster in the offing!